Items of Italian fashion are among the most counterfeited in the world. In fact luxurious fashion brands such as Louis Vuitton, Prada, Gucci and Hermes make up at least 30% of all fashion fakes sold today. This is not news, not a secret any more. Corporations file countless lawsuits each year, often publicize their success in press to raise awareness among consumers that something is being done. Just recently Canada made news for the largest anti-counterfeit law suit win in favor of LVMH and Burberry. Total $2.6 million was awarded to the plaintiffs payable by three Canadian corporations that were accused of distribution of fake LV and Burberry goods. Here in North America we are very counterfeit conscious and even know that we, consumers, can be arrested for buying a fake LV purse or Gucci belt. What is a real eye opener is that while corporations fight counterfeiting in North America and Asia they already gave up to fight it in their own country. If you ever visited Naples, Rome, Venice or other touristic Italian city you see counterfeit stands on the busiest streets of the city, most within minutes from flagship stores. Why this is happening? There are several answers. One would be that law in certain European countries does not protect corporations against this “economical” crime. There are much stricter laws in the USA, Canada and China that in Italy for example. Another reason is that law, even when present, is not reinforced by local police in Italy. In fact, you hardly see police officers in spots one would think are most logical – metro stations, airport, major tourist attractions. And of course, the last, but not least reason – corruption. 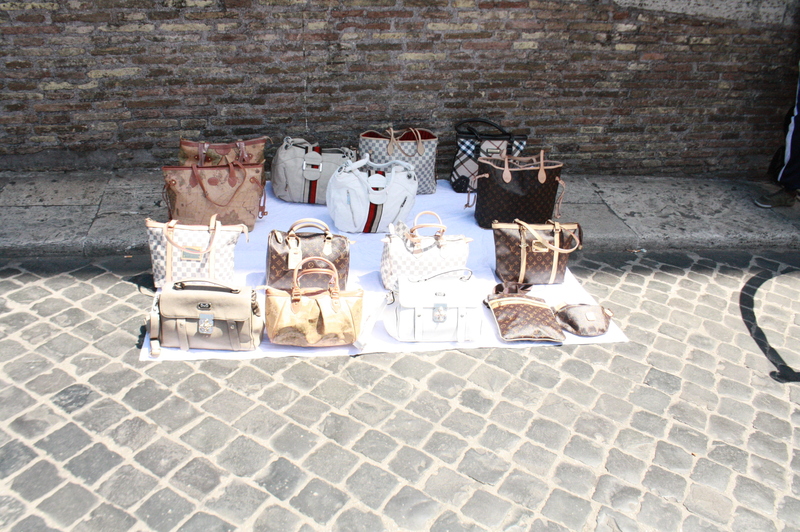 Local police in Italy is getting a cut of the profits for letting counterfeit goods sell on the streets. What is also interesting that fake goods sold in Italy, are not necessarily made in China. According to a bestselling book Gommorah by Roberto Saviano which is now put in award winning film, many of fake goods in Italy are actually made in Italy. Saviano made an extensive research on Naples criminal society that surrounds drug dealing, human trafficking, racketeering and robbery with one Italian “family” Cammora. Saviano touched down on counterfeiting too. There are many very small factories that take orders from large and small corporations along with street vendors. It would not be a surprise that a fake shirt could be made by same factory as a real one. Of course, quality standards may not be met to the same degree and Saviano explains that orders to factories come with very distinct descriptions to what is needed to be done. So with our eyes wide open, we continue to shop in flagship stores and large department stores, eventually training our eye to recognize real goods to the point that we can tell whether that new LV purse on a shoulder of a girlfriend is a fake or real by just looking. Even she bought it in Italy label says “Made in Italy”, we now know it may still be fake unless she shows a box and a receipt from the flagship store.